We’ve all been there – searching for the perfect lunch spot to dine with new clients, seal important business deals or catch up with a friend or colleague. For your next lunch date, keep it classic and cosy with our Italian inspired menu on 10th Ave and 8th St. Chat over a bowl of pasta, get creative with a glass of wine and do it all without a heavy cost. With the colder months coming soon, keep warm and satisfied with our Italian menu choices that showcase some of the best local ingredients. Mains, pastas, sandwiches and more offer an elevated casual lunch experience with our award winning Italian wine list. Savour our weekly three course lunch menu, which is a great option for those looking to simplify their dining experience. 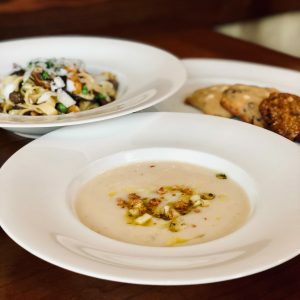 Chef Benjamin Mills designs a new menu weekly with choices for your first and main course followed by nonna’s fresh baked cookies, easy to enjoy there or back at the office. Please Note: If you’re interested in hosting meetings and work gatherings mid-week, we offer our private wine-room upstairs for business lunch meetings. Ensure privacy and productivity without the noice of tables around you in this private and cosy space which hosts a screen for presentations.